Many feel overwhelmed when shopping for such an important piece of jewelry. Here are some of the most important questions which arise while shopping for engagement rings, and some helpful tips to make the best choices for your special someone. #1–Surprise her when you pop the question, or buy with her after the proposal? Lately there is a trend for customers to come together when buying an engagement ring. Sometimes she chooses the style and we discuss the budget with him, but nowadays more and more women are buying their own engagement ring themselves. An engagement ring doesn’t need to be the most valuable and bold piece of a lady’s collection. You’ve got to consider that she is going to wear it everyday of her life. Depending on her profession, it might be prohibitive to wear a bold and tall ring. Nowadays, my customers are asking for very low profile rings. Some are avoiding prongs and going for a bezel setting in order to avoid the ring getting stuck on purses, pockets, or whatever she is wearing. A customer came to the store wearing a ring made of chocolate foil paper, wrapped like origami. This gave her the time to replace it with a ring of her choice. Another customer had planned a trip and could not figure out which ring to buy. So, he bought the center stone and put it in a tension set temporary ring, proposed to her and came back to let her choose the ring she likes for that stone. #2–Center stones: Should I choose a diamond or a colored stone? “Diamonds are forever”–Would you like me to show you my collection of broken diamonds? Diamonds break just as much as any other stones. They are harder to scratch, but under pressure they have natural cleavage that will chip and, if they have some natural fractures inside, they can break. Conflict diamonds are also another factor people consider. Some of my customers just don’t want a diamond as a symbol of their marriage: they want to avoid the idea that her ring could be supporting slavery or weapons for war somewhere else in the world. White Diamonds: While most of my customers prefer the top white, often someone will come for an off-white, champagne, canary or even a slightly yellow-white. Most of the white diamonds have a tint of yellow, so you can get a much better price and a bigger size if you get these diamonds. You always will pay a premium price for the top white. Colored (Fancy) Diamonds: If they are champagne and browns they are less expensive, but if they are colored (green, red, pink or blue) they can be extremely expensive. The most important thing to consider when buying a fancy (colored) diamond is if they are natural or irradiated. Irradiated diamonds have a tendency to be very dark and bright and less expensive, naturals have pale color and go for a premium price. Unusual Cuts: The old mine cut and the rose cut are coming back, and some new designs using the rough. Old mine cuts are preferred because they are antique and therefore conflict free. The rose cut is another option if you don’t want bling. We have designed using some brownish red diamonds for customers that are not into the sparkly diamond. Of the traditional facet diamonds, the best sellers are the round and the princess. These are more plentifully available, which makes it easier to find a good offer. But there is also a high demand for cushion cut–not only in diamonds, but in all gemstones. When looking for a good price, stick to the the round and princess cuts. The most precious colored stones are sapphires, rubies, and emeralds. They are typically the alternative stone option for engagement rings. Sapphire and rubies are the second to diamonds in hardness. Sapphires are a very popular option for engagement ring, due to Princess Diana’s famous ring. Rubies were traditional in Europe before diamonds, and emeralds are far more rare than diamonds. Most people are concerned about treatment on these precious stones. Think again–diamonds are getting as much treatment as the colored stones lately. I’d have to write a whole separate article about stone treatment. I once got a customer using a very rare green garnet as a center stone; she was born in January. Another customer had an old diamond but loved amethyst, so we incorporated some amethyst on the shank of the ring design. Rare Gems: A Nice Piece of Conversation. What about an imperial topaz? Also a birthstone, but in addition a very rare stone–only found in one mine in the world right now. How unique is that? Another customer just chose a alexandrite cateye for the center stone. Not only it is the most rare gemstone in the world, every stone has a unique eye and color change: making the ring as unique as your love. #3–What style should I choose? Research shows that men look for the value of the piece, while women look for the design. When a man is shopping for a ring, he should also consider the uniqueness of its design. More and more customers are choosing the extra cost of buying a uniquely designed piece over a mass production item. Remember, when shopping for a custom designed piece it is going to require more time and effort from you than you might think. If you are thinking about a custom design engagement ring, I would suggest narrowing it down by selecting the center stone, then browse for a style that you think she would like. Identify possible styles (such as clean/sleek modern, geometric modern, romantic/lacy, pavé, organic hand crafted, etc. ), and then check with her friends or someone that knows her well and see what they think. Or try to figure it out based on the jewelry that she already has. Takes lots of picture and bring the pictures with you so a designer could do a sketch of the piece with you. Once the sketch is done a more detailed representation of the piece can be done using CAD or by hand. Some designs are better done by hand, and some are done better by CAD. Most customers know right away if they want a vintage/antique piece or a new one. I guess this is not a difficult question. The question is what to buy. You can find a old ring and pay a premium price for its historic value. Art Deco rings are sharply increasing in price due to demand lately. Or you could consider getting a reproduction. Some molds are made of old rings and they are available to reproduce the same piece using the old mold. The benefits are that you are getting a ring and stone with fewer scratches, and you are sure of the quality that you are getting. Some old pieces are always the same karat of metal that they are stamped for. You can fall in love with a designer jewelry line and it is priceless. Jewelry is an art, and the signature on the ring could be worth a fortune. Imagine if you could buy a car designed in small production, and only a few people in the world would have it? That is a designer piece. Just remember not all the designers are great for custom orders. Don’t go to Picasso expecting him to paint a Matisse. #4–What should the value of the piece be? Some people suggest that an engagement ring should be based on one month’s salary, some say three months. I believe that jewelry should not come with a price tag attached to it. This is one of the best features of colored stones: nobody really knows how much they cost. You can put one diamond engagement ring next to another and say one costs more or less, but when you are talking about colored stones nobody really has any idea. They normally look much more expensive than they really are. The reason for this is because diamonds have the 4 Cs standard that help people to figure the price online. But colored stones have way more than the 4 Cs to figure out the price. Also, because everybody prefers diamonds, you always can find a better deal on colored stones. People think that jewelers really prefer to sell you a diamond ring. Think again—with diamonds, the profit margin is smaller and more controlled by the corporations. Most jewelers really can find better deals on colored stones. #5–What Metal Should I Choose? While precious metals are not the most resilient materials, they are the ones that offer the least risk for the person that wears it and allows us jewelers to most easily work on it. -Does she have any metal allergies? Can she wear white gold or silver without allergies that cause rashes and irritation? -Does she like silver or gold color? Gold in US is mostly sold as 14 karat. If she likes gold, is it rose gold or yellow? 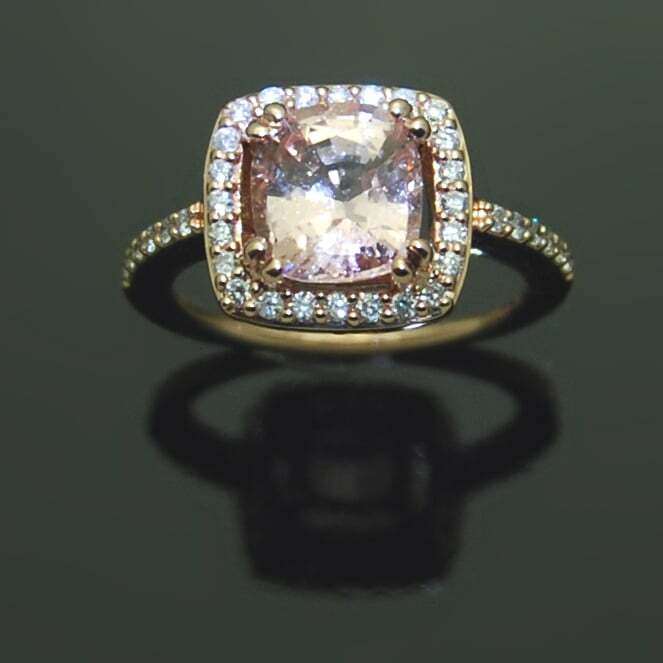 While most yellow and rose gold does not cause allergies, some people need to wear it in a high purity (higher karat) to avoid allergies caused by the copper and silver mixed in the alloy. Rose gold is yellow gold mixed with more copper; yellow gold has more silver than copper. There are a lot of white metals nowadays. Most of them are alloys of several metals; some of them are almost pure. Below are some pros and cons of these types of metals. Silver: Oxidizes easily causing a darker patina. Even though some alloys like argentium silver reduce this property a lot, they still oxidize in the corners and places that are difficult to reach. Silver is the lightest of the white precious metals. If you compare all the other metals next to silver they will look like grey. Platinum: Is a good metal for those who have allergies; because of this it is used in bone replacement surgeries. It is softer than people think, which is why it is normally combined with 10% iridium to harden it. A bad thing is that it scratches very easy and, due to the fact that it started to be used in catalytic converters in the auto industry, its price has been pushed higher than most other precious metals. This is also due to its high density and high purity of its alloy. A ring made in platinum will cost three to four times more than 14kt gold. White gold: This alloy was created to replace platinum and palladium as a commercial alloy to hold set diamonds. It is the industry choice for white metals nowadays. It is normally a combination of yellow gold plus, cooper, silver and nickel. When the gold price was down it was an excellent option, remember in 2005 gold was around $350/ounce –but by 2013 it was around $1300/ounce. The US market prefers 14kt white. That means 14 parts of 24 should be gold. The other parts vary from jeweler to jeweler, and creates color variants in shades of warm white metal. –Pros: It is very good to work with, allows very good casting with high detail. When the price of gold was down it was a great deal. When the price of platinum went up it dominated the market. –Cons: One of the major drawbacks of white gold is that to keep it affordable and bright white most of it comes with nickel, a metal which cause allergies in some people. It has a warm white color; most market pieces have rhodium plating to brighten it up. This requires the plating to be redone every couple of years depending on the person that wears it. The other bad thing is since the non-gold part of it varies, the resulting color differences make it hard to get two pieces from different jewelers to match unless they have rhodium plating. But, when the plating wears off it could show the difference. Palladium: Normally combined with 30% iridium to harden it, is a great alloy for those who have allergies. It is light and affordable with prices today comparable to 14kt white gold. The only bad thing is that it is a darker grey compared with white gold and it does not take Rhodium plating well, which is what makes the white gold shiny and bright. Again, precious metals are the ones that do not cause allergies and skin rashes and which are also easier to manufacture–which is not the case for these alternative metals. –Pros: Very inexpensive and readily available. –Cons: Requires high temperature casting, mostly used as a base material for jewelry in mass production done by machines. It is hard to make by hand. Laser solder techniques allow us to size some rings, but it is still a major problem for this metal. There are some stainless steel alloys that are nickel-free and produce almost no allergies. –Pros: A dark gunmetal color, very hard to scratch and no known allergies. Very inexpensive. It is very heavy giving the sense of security and durability. –Cons: Very hard to make, making it impossible to be made in small production. It can crack like a rock if you hit it in a hard surface. Impossible to size. Once you have to change the size you have to buy a new one. Not an option if you want it to last as long as your love. –Pros: Very light weight, which some people prefer so that it does not feel like you are wearing a ring. It has a typical grey color, it is very strong. –Cons: Very hard to size, it does not accept soldering. It is used in mass production. #6–What things should I consider before I buy? #7–What things should I consider after I buy?